This article is about the creatures. For the language, see Falmer Alphabet. For the race, see Snow Elf. The Snow Elves and Nords fought for centuries, from the Late Merethic Era to the early First Era, but the Snow Elves were steadily pushed back by waves of Atmoran reinforcements. The devastating loss of the Snow Elf leader, the Snow Prince, ended the Snow Elves' last, best hope. 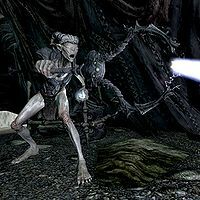 They had long maintained an uneasy alliance with the Dwemer, whose underground cities remained safe from the Nordic incursion on the surface. And so, faced with extinction, they called upon their kin for help. The Dwemer agreed to provide them a haven, but only at the price of their sight. The Snow Elves who agreed, the Betrayed, were forced to consume only toxic fungi which rendered them blind. 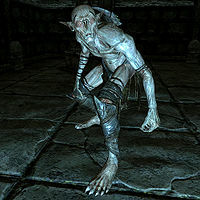 Notably, the Nords also took Falmer slaves in the course of their conquest, forcing them to construct the city of Windhelm. During the reign of the Nordic High King Harald (1E 143-221), the last of the Snow Elves (at least, to the Nords' knowledge) were driven from the province's traditional borders. Staubin's Diary by Staubin — An account of an expedition into Nchuand-Zel. Stromm's Diary by Stromm — Research notes on an expedition into Nchuzand-Zel. This page was last modified on 21 October 2018, at 07:09.